Wealthy merchant Jonathan Warner (1726–1814) was born and died in Portsmouth, New Hampshire. He married three times; through his second wife, Mary Macpheadris Osborne, Warner acquired the the Portsmouth mansion built by Mary’s father, Archibald Macpheadris, but today known as the Warner House. Prominent in local affairs, Warner became a member of the King’s Council in 1766 and was made a justice of the peace in 1776. His Tory leanings caused him to refuse to sign the Association Test of March 1776, a loyalty oath to defend the colonies by force of arms. In spite of his loyalist politics, he was able to remain in Portsmouth throughout the Revolutionary War. The commission for Jonathan Warner may have originated with Warner’s marriage to Mary Macpheadris Osborne; the canvas is dated 1761 by the artist and the couple had wed in October 1760. 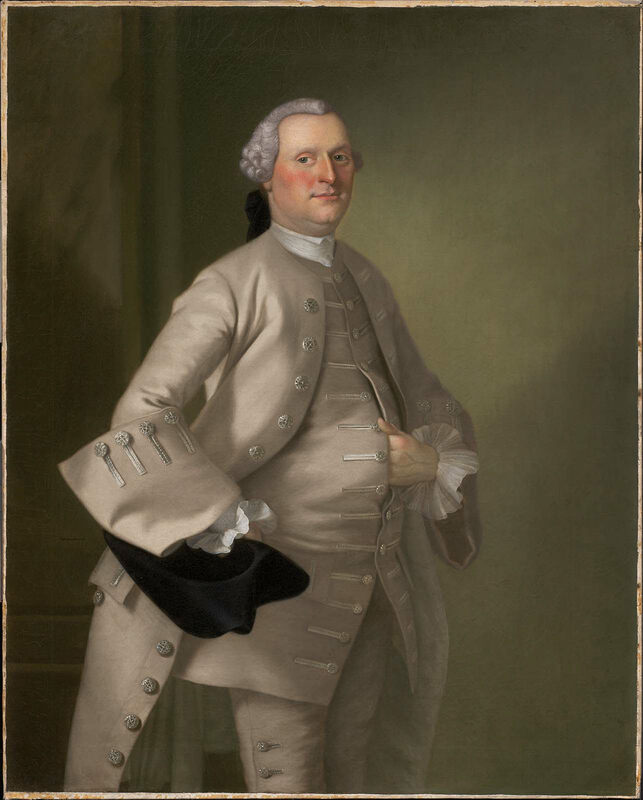 Joseph Blackburn worked in Portsmouth from 1759 to 1761, painting six members of the Warner family. Five of these portraits are still at the Warner House: Mary Macpheadris Osborne Warner, probably a pendant to that of her husband; her mother, Sarah Wentworth Macpheadris Jaffrey (who had married George Jaffrey II [1999.503] after the death of her first husband, Archibald Macpheadris, the builder of the house); Jonathan Warner’s daughter by his first wife, Mary (Polly); and Warner’s two brothers, Samuel and Nathaniel. The sixth, the MFA’s portrait, was acquired from the family in 1883 for $300 and became the first portrait, American or European, ever purchased by the Museum. Ten years later, Jonathan Warner was exhibited at the World’s Columbian Exposition in Chicago—one of a handful of paintings then in the collection that were sent to the exhibition (see also Lair of the Sea Serpent [84.283] by ElihuVedder and The Three Wise Men [90.151] by John LaFarge). Charles Brewster, writing in his Rambles about Portsmouth in 1859, could have been describing Blackburn’s portrait of Warner when he noted, “We well recollect Mr. W. as one of the last of the cocked hats. As in a vision of early childhood, he is still before us, in all the dignity of the aristocratic crown officers. That broad back, long skirted brown coat, those small clothes and silk stockings.” In the portrait, Warner wears a fine wool suit with silver buttons and trim and poses with his hand in his waistcoat. The former implies his wealth, while the latter is indicative of his stature as a gentleman, according to eighteenth-century etiquette books. Using a harmony of grays, Blackburn created a subtle, yet sumptuous portrait of a successful man. 1. Charles Brewster, Rambles about Portsmouth (Portsmouth, N.H.: C. W. Brewster and Son, 1859), 139. Lower left: J. Blackburn Pinxit 1761.